One of the many reasons why insulation in Cleveland homes is so important is that it prevents the forces of nature affecting your home in a variety of ways that span from light damage to thorough structural risks. One of these negative affects caused by a lack of insulation in Cleveland homes is ice damage. Ice damage is caused by poor insulation that allows for heat to escape from your home. Ice dams begin to form in and around the ceiling of your home that eventually warm and allow for water to seep into the structure if your roof. This water also seeps into the insulation of your roof. Wet insulation is ineffective and can also become a breeding ground for various moisture loving bacteria. The problems of ice damage forming starts with insulation. Homes with poor insulation in Cleveland have heat that is migrating out of the house and toward the roof. Snow that lands on the roof of a building eventually melts, and when it does melt, the water that was once snow gets sent down the eaves of the roof. This area tends to be a cooler part of the roof, and so the water re-freezes. 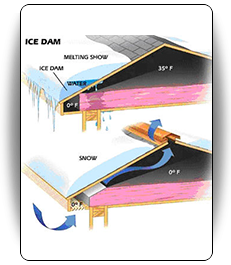 As this process continues, more and more ice forms from melting snow traveling to the eaves of the roof, creating an ice dam. Behind the ice dam is water that is traveling but not yet frozen. As the ice dam gets larger, the result of poor insulation in Cleveland homes, the water becomes so backed up that it begins to seep into the roof. When it does, the water infiltrates whatever insulation your home may already have and can also infiltrate the walls of your home. The water not only threatens the structural integrity of your home, it also turns your home into a potential biohazard by breeding mold. Call The Siding & Insulation Company at (216) 281-5656 to speak to our talented team of specialists for insulation in Cleveland and Northeast Ohio. We will be happy to answer any of your questions about ice damage and what we can do to help you prevent it from destroying your home or building.